Maybe those who were of the school age in the 70s will know this name. 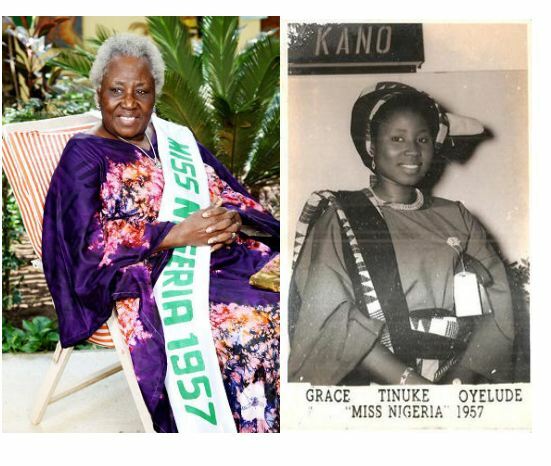 For purpose of the young generation, she was crowned the first Miss Nigeria in 1957 in a contest that involved over 200 young girls from all parts of Nigeria. She completed her training and became a State Registered Nurse (SRN) in 1961. Not yet satisfied with her achievements, she enrolled immediately at the school of midwifery, St. Thomas Hospital, London from where she qualified as a state registered Midwife SCM (NRM) in 1962. Her thirst for laurels took her to the Royal College of Nursing, Englandin 1971 and obtained a Diploma in nursing and Hospital Administration (DNHA) and 1976, she obtained another diploma from Ghana Institute of Management and Personnel Administration. Grace Atinuke Oyelude after being crowned first winner of Miss Nigeria contest, 1957, representing the North. She’s from Kogi, born in Kano.